As seen on the hit TV show "The Doctors"
Affirm Laser treatments are taken to the next level with the Combined Apex Pulse (CAP) technology in the Affirm system. The Affirm is a fractional light energy device that allows for a more relaxed and effective treatment with longer lasting results for patients. A topical anesthetic may be applied prior to treatment, however, a majority of patients do not find it necessary to apply the anesthetic and opt to procede with treatment without using this option. 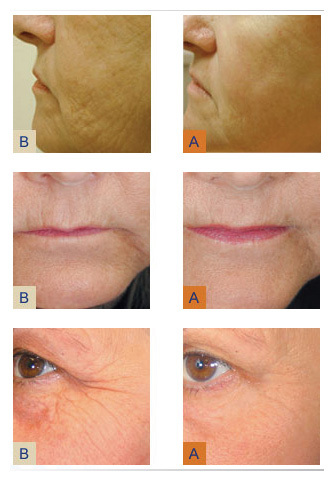 Most all skin types can be treated effectively with very little to no downtime post treatment. The Affirm works by micro-pulses of light to the dermis to aid in collagen stimulation, correction of wrinkles and acne scars, and photo-aging. The side effects from treatment are mild redness that usually resolves in just a few hours and some clients may report some mild puffiness and swelling that quickly resolves. A series of 3-6 treatment sessions is typical depending on the type and severity of the condition being treated. It usually takes about 3-8 weeks after the first session to start seeing results. Many clients state they are experiencing overall skin tightness and clarity with their first treatment.